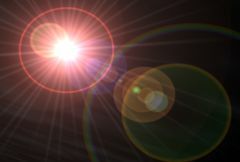 Renders a lens flare image over the background clip, aligning various flare elements between the hotspot and pivot locations. Use the Lens menu to select different types of lensflares. Background: The current layer. The clip to apply the lens flare over. Occlusion: Defaults to None. Obscures and colorizes the flare. The brightness of the flare is reduced based on the opacity of this clip, and the color at the hotspot location is used to tin the flare . These behaviors can be adjusted with the Occlusion Softness, Occlusion From, Invert Occlusion, and Use Color parameters. Mode: Popup menu, Default: 2D . Selects between several variations of the LensFlare effect. 2D: The hotspot is positioned manually. The flare may be occluded by a Matte input. 3D: One or more hotspots can be connected to Lights within a 3D composition. The flare may be occluded by 3D layers within the comp. Resize Mocha: Default: 1, Range: 0 or greater. Resize Rel X: Default: 1, Range: 0 or greater. Resize Rel Y: Default: 1, Range: 0 or greater. Scale Widths: Default: 1.15, Range: 0 or greater. Scales the vertical dimension of all the flare elements, making them elliptical instead of circular. This can also be adjusted using the Scale Widths Widget. Rotates the ray elements of the lens flare, if any, in degrees. Hotspot: X & Y, Default: [-0.444 0.176], Range: any. The location of the brightest spot in the flare in screen coordinates. It can be set by enabling and moving the hotspot widget. Hotspots: Default: 0, Range: 0 or greater. The AE light(s) to attach the flare center to. Pivot: X & Y, Default: [0 0], Range: any. The elements of the flare will be in a line between the Hotspot and the Pivot locations. The Pivot location is in screen coordinates. Hotspot Bright: Default: 1, Range: 0 or greater. Scales the brightness of the background before combining with the flare. If 0, the result will contain only the flare image over black. Determines how the flare image is combined with the Background. Add: causes the flare image to be added to the background. Affect Alpha: Default: 1, Range: 0 or greater. Occlusion Layers: Default: 0, Range: 0 or greater. The AE layers to occlude the flare hotspot by. Show Scale Widths: Check-box, Default: on. Turns on or off the screen interface widget for adjusting the Scale Widths and Rel Heights parameters.This parameter only appears on AE and Premiere, where on-screen widgets are supported.